Snow Performance now has a new 10 Gallon Reservoir available for those looking to maximize the range of their water/methanol injection system. The new 10 Gallon Reservoir (Part #40015) offers a larger fluid capacity but in a nice, compact design. The tank tucks up nicely against the side of your truck bed limiting the amount of bed space used. 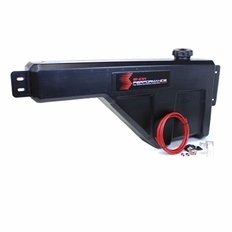 Our methanol injection 10 Gallon tank mounts directly to the top bed rail and is engineered to sit above the wheel well in any pick-up. Reservoir comes complete with pre-bent aluminum straps, fitting, 20 feet of tubing, and a Solenoid Upgrade. Snow Performance always offers the most complete kits and upgrade components at the best prices. Compare the Snow Performance 10 Gallon Reservoir with the competitors that sell only the tank (no straps, no line, or solenoid) and you'll see that we bring the best value for your money again.